Defending NHRA Pro Stock Motorcycle champion Matt Smith got some great off-season news as DENSO has decided to step up as the primary sponsor on Smith’s Buell for the 2019 campaign. DENSO, an affiliate of leading global automotive supplier DENSO Corp, will also continue its support of Smith’s wife Angie. 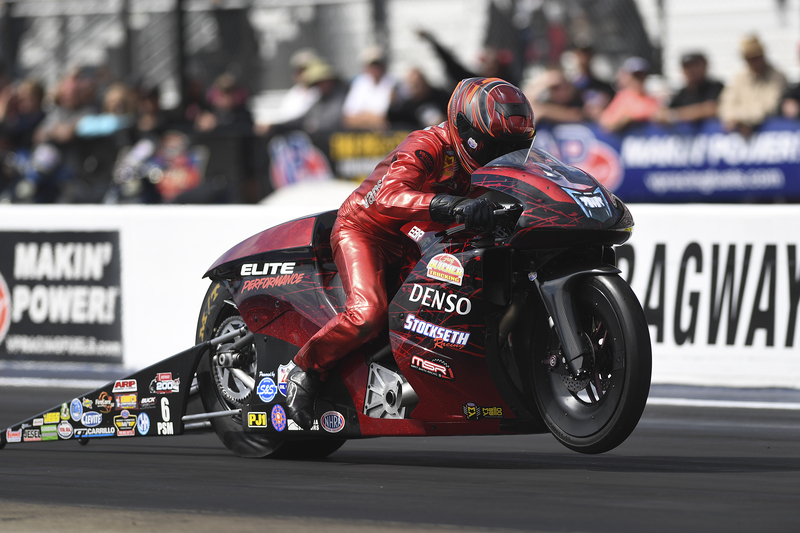 Using DENSO Iridium spark plugs last season Smith clocked the fastest Pro Stock Motorcycle pass ever at 201.22 MPH. DENSO’s Lisa Michler shared the Smith’s enthusiasm. March 14-17 — Amalie Motor Oil NHRA Gatornationals, Gainesville, Fla.
April 26-28 — NGK Spark Plugs NHRA Four-Wide Nationals, Charlotte, N.C.
May 17-19 — Virginia NHRA Nationals, Richmond, Va.
July 26-28 — NHRA Sonoma Nationals, Sonoma, Calif.
Sept. 12-15 — Dodge NHRA Nationals, Reading, Pa.
Nov. 7-10 — Auto Club NHRA Finals, Pomona, Calif.